I'm still working on this but how about "Craft Guerrilla hosts Crafternoon - a DIY Craft Event"
Craft Guerrilla is a group set up to work with independent Crafts People, Artists and Designers Makers of quality hand made goods. The aim of the Craft Guerrilla is to join forces with other creative individuals and set up craft events in vacant or unused venues and associate with "friendly" businesses and other Craft groups. The Craft Guerrilla Army is taking on the world for a better hand made existence! We've had enough of soulless, mass produced tat and so has the average consumer. gained by working within a creative community. We're all for learning and that's why we are promoting our DIY craft events and our work shops - "classes for the masses". We're a peaceful bunch but we're looking to create opportunities, we're ready to take action, take over and DIY our own opportunities. At the workshop we will be selling our craft kits for a small fee which we have made especially for the Indietracks festival. 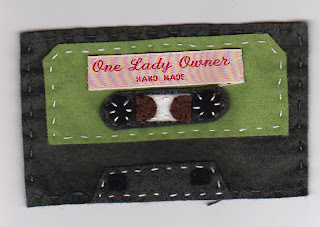 The kit will be to make a felt mix-tape badge and is exclusive to this event. Everything you need to make the badge will be included in the kit and the Craft Guerrilla tutors will be on hand to help with the threading of needles, which stitches to use and anything else that you need to help you in making your badge. All of it! We're stupidly excited about the festival! Put matches for lighting your camping stove in an old film canister so they don't get wet and use Swan Vestas so they can be struck on anything. Keep your loo paper in the plastic wrapper it comes in and make a small hole at the bottom to pull it out of so you have your own waterproof toilet roll dispenser. Finally, an inflatable mattress and electric pump will ensure the best nights sleep you've ever had when camping. Well worth the extra rucksack space! Thanks! You can catch the workshop at 4pm on Sunday, in the Workshop Wigwam.